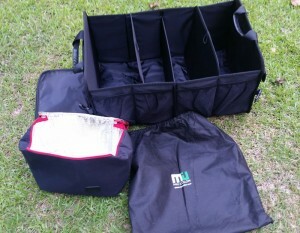 MIU COLOR® Foldable Cargo Trunk Organizer is a High Quality Washable Storage with Reinforced Handles and Durable Cover. I received the trunk organizer with a bonus soft sided cooler a couple of months ago. When I first opened it – I knew I’d find several uses for it. There’s so many features in this well constructed organizer! It can be stored in its own zipper case which has a handle. Also comes in a stuff sack. 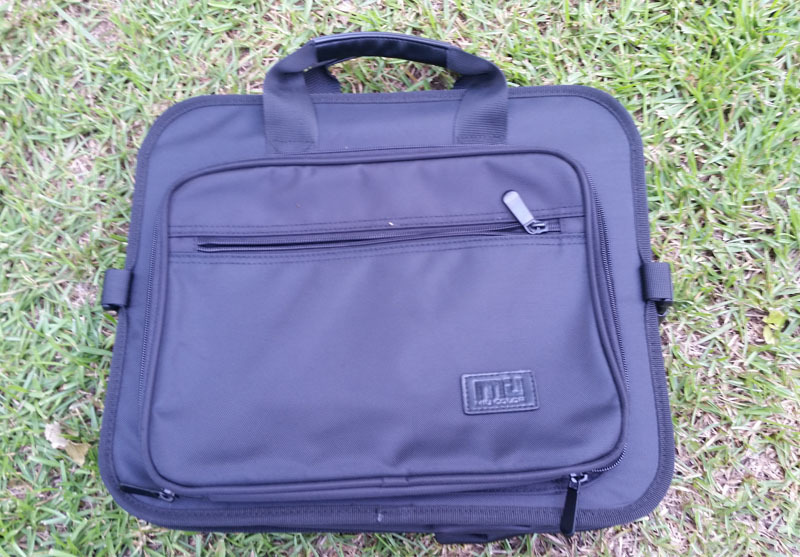 It has dividers on the inside that can be moved to use in different configurations and a variety of pockets on the outside. 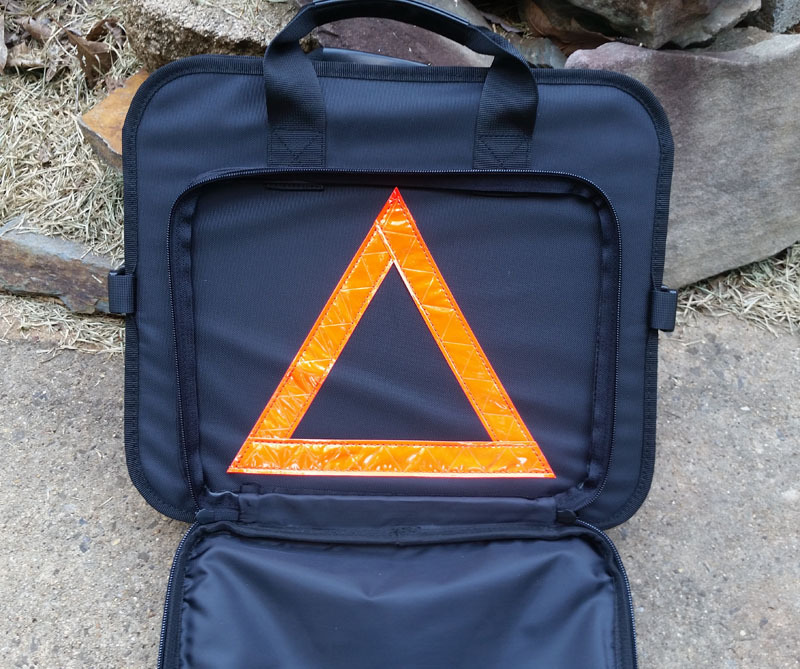 A nice little plus is it has a reflective triangle that can be used in the event you are broken down on the side of the road. Depending on your lifestyle this trunk organizer has so many uses. For your gym gear, sports gear, groceries, office supplies, baby gear – it’s endless. After using it a few times for groceries…. I am now storing jumper cables, blanket and a small bag with hammer & a few emergency supplies. Sort of a bug out bag (BOB). These items have always been in the trunk of my Toyota Corolla – however they were always rolling around. Now they sit neatly in the MIU Color trunk organizer towards the back of the trunk. When I go to load groceries these items are not in the way anymore. This great organizer will bring the OCD out in anyone haha! It’s worth clicking on the link to view more about their product if you need some organization in your vehicle. Made with High quality 1680 DD polyester. Non-slip gripper pads at the bottom will prevent sliding around! Flexible space design makes it easy to expand and fold up, when folded, it likes a hand bag, space saving. 8 High Quality bags outside make it easy to store and find your small things. Also, a stiff cover will protect your stuff better! MIU COLOR Cargo Trunk Organizer keeps Your Car Tidy and Under Control, also Benefit all Your Life! ✔ When Shopping? Easily store your shopping bags and prevent your groceries from rolling around your trunk. ✔ When Sporting? It will also be good sporting equipment, you can take the organizer out of the vehicle right to the field. ✔ When Traveling, Hiking, Picnic? Take the trunk organizer to the park, the beach, the sports field, or any place you need to be organized, put the all the things you need in it, go out for your summer time! ✔ Even in an emergency? Just remove the organizer from your vehicle and place outside for additional visibility. A warming reflective parking triangle sewn on the pocket will be useful. Please do not wash the organizer in water or wash it in a washing machine, it will badly damage the organizer. We advise you clean it by wiping the surface slightly back and forth with damp cloth. If stains with oil or drink, you could also use a small brush like toothbrush to clean them. After Clean, put the boxes in ventilated place until they are totally dry. Dry it in the HOT SUN will not be recommended!